Just about all bullion investors worry about counterfeits. Those concerns are magnified when someone is buying for the first time. Stories about fake coins from Asia and gold bullion bars drilled and filled with Tungsten have been in the headlines recently. But the truth is, counterfeiting is just about as old as the concept of money itself. Before diving into all the ways that fakes can be detected, the first and best protection is to work with a reputable and knowledgeable dealer such as Money Metals Exchange. Recently voted "Best in the USA," Money Metals has high quality control and internal screening standards, plus it stands behind the metals that it sells to customers. Fortunately, making phony coins or bars isn’t easy. The equipment involved is significant – it takes far more than a color printer and the right paper. And making fakes good enough to pass a few simple tests is darn near impossible. Some testing equipment, such as mass spectrometers and sonogram machines, are expensive and impractical for the typical person to use. However, there are some lower budget ways you can determine whether or not the bullion you hold is genuine. Gold and silver are extraordinarily dense metals – much denser than just about any base metal (even lead and mercury in the case of gold). That means just about all fakes that weigh correctly will be too large in diameter and/or thickness. Or they will be underweight in order to achieve the right diameter and thickness. Simply comparing the diameter and thickness of the coin in question with others known to be genuine could be enough to put you at ease. If not, an inexpensive set of calipers and a jeweler's scale are a good way of checking. Every bullion coin or round is produced with close tolerances in terms of diameter, thickness, and weight. You can find these dimensions on the “Specifications” tab on our coin and round product pages. Investors might also consider Fisch Testers. 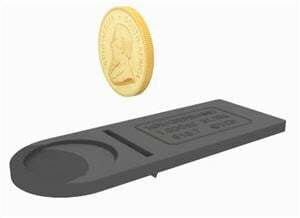 Genuine coins will be both small enough in diameter and thin enough to fit through a slot in the tool, while remaining heavy enough to tip the tool on its fulcrum. Simple and very effective. Base metal coins will sound duller and their ring will be shorter -- much like the difference between clinking crystal versus glass champagne flutes. Try balancing the coin on your fingertip and strike it with another coin. 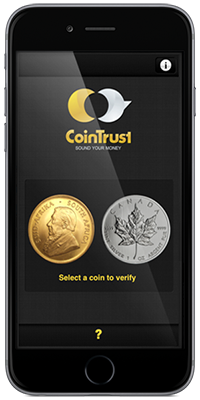 Investors with an iPhone can also install the CoinTrust application and test a short list of the most popular silver and gold bullion coins by gently spinning them on a hard surface with the phone’s microphone positioned nearby. Android users can install the Bullion Test app. Choose the coin from a drop down list, press the microphone button, then balance the coin on your fingertip and strike it with a fingernail or another coin. Results are instant and accurate. Silver possesses a number of remarkable properties that make it valuable in a variety of industrial and high-tech applications. Silver is dense, ductile, highly reflective, and one of the most highly conductive metals in existence. However, silver is not magnetic. Silver’s lack of magnetic attraction gives you a quick way to test any given silver product to see if it contains foreign metals such nickel, iron, or cobalt. These cheaper metals will respond to magnets. Fake silver products rarely appear for sale anywhere, if no other reason than there’s far greater financial incentive for forgers to tamper with gold bars or numismatic coins. Some fake silver novelty items from China may occasionally show up at flea markets or on eBay. You won’t have to worry about that if you buy your precious metals from a reputable coin dealer that sells products guaranteed by mints to have specific weight and purity. Silver is one of the best conductors of thermal energy found in nature. 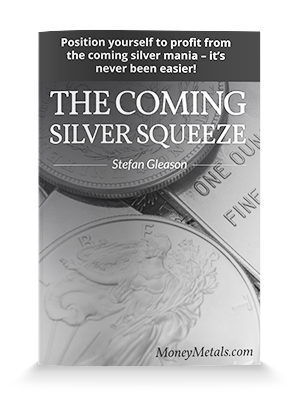 That makes it easy to test silver bullion using nothing more than an ice cube. Place an ice cube on top of a coin, round, or bar, and you should see it begin melting almost instantly as heat is quickly transferred, as long as it is a pure silver bar, coin or round. 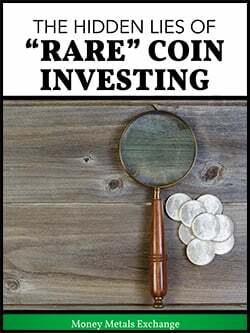 Holding a coin or round between fingers or in the palm of your hand makes the results even more noticeable as the silver rapidly cools to your touch. 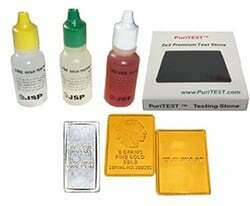 Investors can purchase inexpensive acid test kits for gold and silver. Watching the color change in a drop of acid can reveal whether or not a sample is genuine. However, acids should be handled carefully. Your items can be permanently discolored. Since bullion coins, rounds, and bars are valued for their metal content, not their beauty, discoloration is unlikely to reduce the value of your bullion by more than a small amount. But it’s still wise to use acid testing sparingly and with caution. 10-ounce and 50 grams gold bars are among the easiest to tamper with as they can be drilled, filled with tungsten, and then plugged again with gold. This is more difficult with units 1 oz and smaller. Tungsten is extraordinarily hard whereas gold is soft. This means tungsten is very difficult to use in minting or fabricating small items. It is brittle, and stamping it with a design will result in coins with less detail unless it has been plated with a thick layer of gold. As outlined above should still offer defense against tungsten fakes. Never buy gold bullion below its melt value unless you know and trust its origins. No metal shares a similar density to silver, making it even more difficult to make good counterfeits than with gold. Plus, the financial incentive is lower. Recently some of the more prominent mints and refiners have begun employing technology to mark products with seals that assure authenticity. For example, Sunshine Minting rounds and bars carry a seal that reads "VALID" when viewed using their proprietary lens and oriented correctly. As mentioned above, the best defense against fake bullion is to buy from a reputable dealer. Money Metals Exchange sources products directly from well-regarded mints and refiners and employs good quality controls. That is why we can confidently stand behind every product we sell – guaranteeing authenticity, weight, and purity.